RANGOON — Burma’s Union Parliament on Monday passed a law granting temporary citizens the right to vote in a constitutional referendum slated for later this year. The 2015 referendum law automatically enfranchises about 1.5 million “white card” holders, who live in Burma but do not enjoy full citizenship rights. A 328-vote majority approved the legislation, while 79 lawmakers voted against it. Nineteen seats abstained. Critics of the law, while heavily outnumbered, expressed their disappointment over its passage claiming that it could threaten national stability. 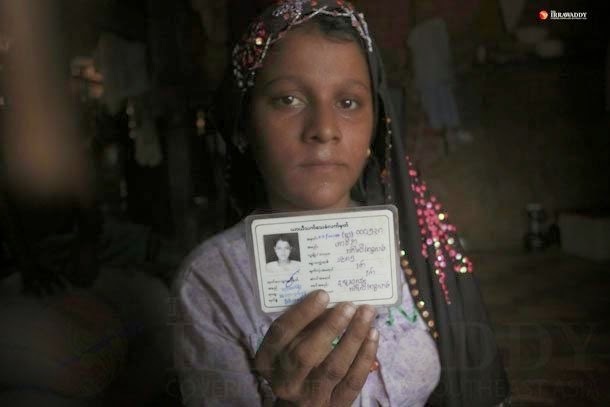 The lawmaker was referring to a block of 700,000 potential voters in his home state of Arakan, in western Burma, where many members of the Rohingya Muslim minority were issued white cards more than two decades ago. “There would be no problem if these people had real citizenship cards,” he added, though a Citizenship Law passed in 1982 precludes that possibility unless they forego their ethnic identity. Burma’s roughly 1 million Rohingya Muslims were stripped of citizenship when the law was passed by the former junta, and they are largely viewed as illegal immigrants from Bangladesh. A citizenship verification program piloted in mid-2014 sought to integrate some members of the population who met stringent criteria outlined in the law, but it controversially required applicants to identify as ethnic Bengali. Several other lawmakers—notably ANP Chairman Aye Maung—voiced similar opinions about extending voter rights to those without full citizenship, though the new law’s supporters pointed out that white card holders were allowed to vote in the past. Parliament’s Joint Bill Committee, a powerful drafting body comprising members of both houses of Parliament, wrote an initial version of the referendum bill that conspicuously took away the right of white card holders to vote, expressly granted in a 2008 referendum law approved before the 2008 Constitution was adopted. President Thein Sein sent the bill back to the committee recommending that it reinstate voter rights before reaching the floor for a vote. The committee accepted the change, resulting in a version that allows all citizens, foreign registration card holders and white card holders over the age of 18 to vote in the national referendum. The referendum is expected to be held in mid-2015, when the public will be asked to approve amendments to Burma’s military-drafted charter. A constitutional review committee has recommended a total of 95 revisions, though they have yet to be approved by Parliament or the president. In its current form, the charter reserves 25 percent of parliamentary seats for the military, and amendments to many articles require more than 75 percent parliamentary backing and a 50 percent approval by referendum. Several lawmakers expressed concern that the bill committee may have been pressured by the president and the ruling party into changing their position on voter eligibility. Ba Shein, an Upper House member of the ANP who served on the committee, told The Irrawaddy that the Union Solidarity and Development Party (USDP) asserted its dominance for political gain, resulting in a law that did not reflect the desires of lawmakers. “The [bill] committee met three times, and we did not all agree to let white card holders vote,” he said, “but the committee changed its position yesterday because of the president’s remarks on the draft. “They are USDP, and this is a USDP government. They are doing whatever they like,” he added. He and several other Arakanese party members expressed concern that the USDP had initially extended voting rights to white card holders in an effort to secure their support in general elections. When allowed to vote in the 2008 referendum and again in 2010 general elections, white card holders overwhelmingly supported the USDP agenda. Shwe Maung, an ethnic Rohingya lawmaker and member of the USDP, was among the supporters of the new law, though he declined to address the media about the issue. - See more at: http://www.rohingyablogger.